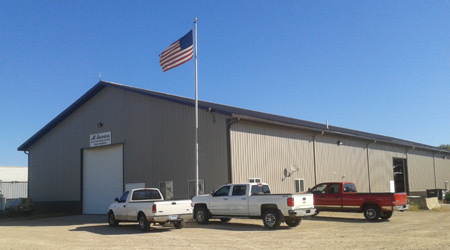 JR Services in New Prague, MN is a full service Heavy Equipment Maintenance and Repair shop and a specialty Machining, Fabrication and General Repair facility that is owned and operated by John Bendzick. John's father provided tractor repair services throughout the area for decades and was the inventor of an industrial metal machining scrap recovery machine called PuckMaster. progression for John to continue the family tradition of service to his community when he began JR Servives in the year 2000. Also, as the son of the inventor of the PuckMaster equipment it was natural to continue providing custom machining and fabrication of replacement parts for PuckMaster maintenance and repair. With more than 30 years of expertise and experience, the team at JR Services provides service and repair for local Agricultural and Commercial heavy equipment maintenance and repair needs. JR Services also provides Replacement Parts, Repair and Resale for the PuckMaster Machines nationwide. Our large parts inventory and our "Superior Service" can have a technician at your location the next day keeping your down time to a minimum. For more information on our local Maintenance and Repair services visit our Services page and for more information about our PuckMaster Parts, Repair and Machines for sale visit our For Sale page. Thank you for taking the time to visit our website and we look forward to hearing from you and helping in whatever way we can.